The other day, someone tweeted me and asked if I could talk a little more about how I use the online tool Airtable. I’m happy to oblige! Airtable is a spreadsheet tool that is similar to Excel. It has an online browser option or can be used in an app. What I like about Airtable is that it was easy to learn, works well with color-coding, and is easy to use in collaboration with others. There are also several ways to output data (as a calendar, for example) and to connect data in multiple tables (like you might in a relational database). Here are the main ways that I’m using this tool, with some accompanying screenshots so you can see how I’m organizing each example. 1. As a social media organizer. I manage a few different social media accounts, particularly on Twitter, and for at least two of these accounts I collaborate on content creation with one of my staff at the Ecampus Research Unit. Airtable has allowed us to create monthly content calendars that can go through various approval stages before any content gets posted. Not only does Airtable make the collaboration component of this easy because the spreadsheet can be shared among various people, but it’s also allowed us to plan our content weeks in advance. 2. As a course/project planner. 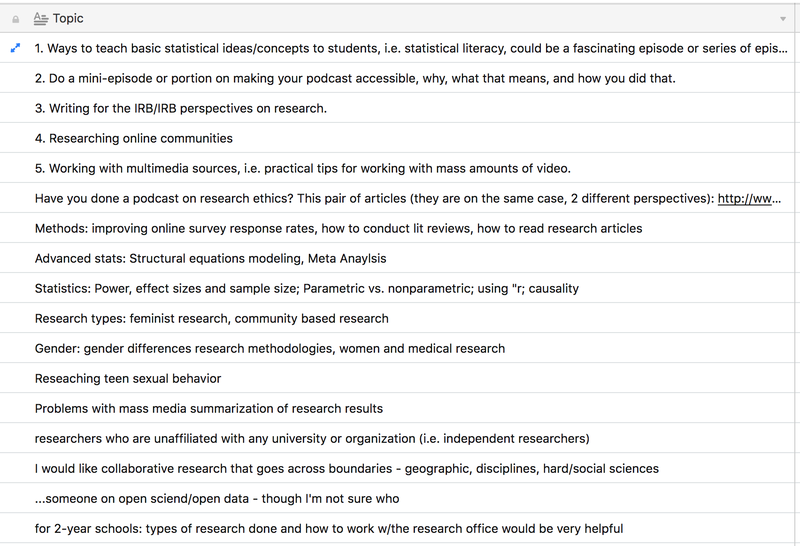 When I was creating SoTL by Design, I posted several times on social media about how I was using Airtable to organize and track the content creation of the course videos and the accompanying workbook. 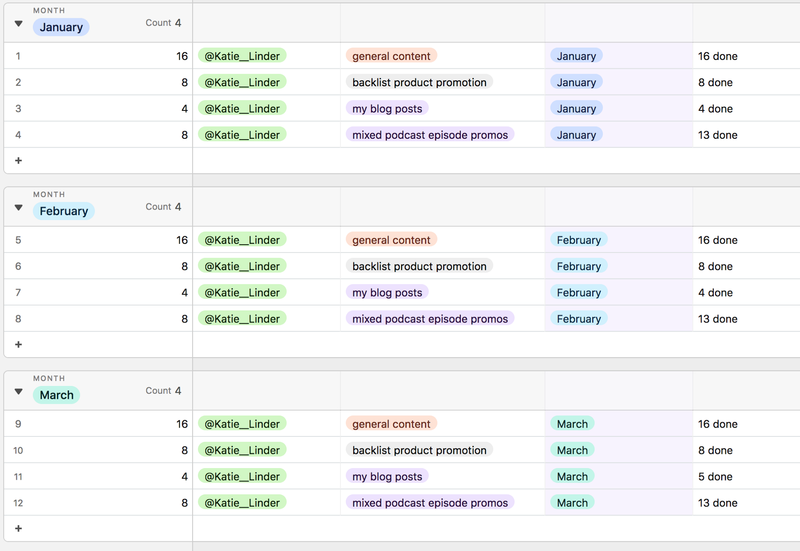 Because the course was organized into color-coded modules, I was able to use color in Airtable to visually separate out the content planning. I also used the checkbox feature of Airtable so that I could track what percentage of the course was created at any given time. Now that the course is launched, I use Airtable to track workbook orders that need to be shipped for new course participants (and I can easily share this spreadsheet with my partner who is often the one making the FedEx runs). 3. As a podcast guest database. One of the podcasts that I host, Research in Action, is an interview-based show where I talk with different guests each week from all over the world. To stay on top of releasing weekly episodes (something we’ve done for the past 2+ years), I have a spreadsheet of potential guest and topic ideas. I often bulk record episodes, so when I’m preparing for a day in the studio, I can refer to the potential guest list to see who I might want to send invitations to. I also use this spreadsheet to keep track of guests once they’ve come on the show and to make sure they get a handwritten thank you note from me, as well as an annual check in about their episode download rates. 4. As an edited collection planning tool. Over the past couple of years, I’ve been working on two different edited collections with dozens of contributors. Airtable has offered an excellent way of tracking the progress of each chapter in the book through its various stages, as well as organizing my communications with the many contributors. Now that the collections are nearing completion, Airtable has been used to organize contributor information for the book websites we’re building. Those are four of the current ways that I’m using Airtable, but there are many other possibilities. The other great thing about this tool is the numerous templates that are offered as examples of how to get started with various uses. Although many of the templates haven’t been a perfect fit for what I needed, they were an excellent starting point for a spreadsheet that I then revised and modified to meet my particular needs. How do you use spreadsheet tools for organizing projects? What other uses would you have for a tool like Airtable?